Are your business’ signs ADA-compliant? What are the full requirements for proper ADA signage and graphics — and do you work in an industry with special standards? SpeedPro Imaging produces ADA-compliant wall, ceiling and mounted signage — including custom braille signs and regulation wayfinding graphics — for clients spanning all industries. Ensure your building is both up to code and inclusive by partnering with our network of ADA-fluent printing pros. The Americans with Disabilities Act outlines federal laws prohibiting discrimination against or unfair treatment of individuals on the basis of disability. The legislation provides equal opportunity protections for employment, transportation, education, accessibility and other civil rights matters. The ADA also directs accommodations for public facility and commercial building access, including compliant building and room signage. Overhead signs: As the name suggests, overhead signs are a particular class of ADA-regulated signage that hang from ceilings or are vertically mounted on walls a minimum of 80 inches above the floor. They often contain informational and directional text. A compliantly sized business sign is dictated by its mounting height and maximum viewing distance. According to the ADA, the majority of mounting heights should be no lower than 40 inches from the ground and no higher than 120 inches. Viewing distances are calculated in feet and should use logical estimates given a room’s layout, entryways, exits and lines of sight. While the ADA doesn’t maintain set sign dimensions, it does have sizing guidelines related to each of the four sign categories. Sign width: A sign’s length is determined by the number of characters (individual letters, numbers and punctuation marks) and spaces between characters per line on the sign. The size of each letter and individual space will also play a role in overall sign width. Sign height: The height of an ADA-compliant sign is determined by its total number of lines and the size of the characters on each line. ADA-compliant signs can be installed in three locations: wall-mounted, wall-protruding and overhead. Wall-mounted signs: Wall-mounted identification signs must be placed on the latch side of a door, between 40 to 60 inches off the ground. There should be 18 by 18 inches of open, clear floor space surrounding the placed sign. If double doors are present, signs should be installed to the right side of the right-side door. Wall-protruding signs: Signs protruding from walls must be a minimum of 27 inches off the floor and stick out a maximum of four inches. Protruding signs should not block doors, sprinklers or emergency equipment. Overhead signs: The bottom of an overhead sign must hang at least 80 inches from the floor and be held by stable, secure means. Like protruding signs, they must not block doors, sprinklers or emergency equipment. Regardless of type, a sign’s final placement should be a minimum of 40 inches from the ground and a maximum of 10 feet from the ground to support reasonable reading vantages. Visual text: Visual text encompasses the standard English characters printed in raised text. Raised text should be 1/32 an inch or .8 millimeters from the sign’s background, written in all uppercase if it’s an identification sign. Informational, wayfinding and overhead signs can be sentence-case. Tactile text: Tactile text most commonly refers to Braille lettering located directly beneath a sign’s visual lines of text. The ADA regulates which fonts are appropriate for a sign’s standard printed characters. Sans Serif and Simple Serif-style fonts are the standards. In addition, a sign’s raised-print text should not contain excess bolding, obliques, italicizations or any other form of font embellishment. The ADA recommends signs be “high contrast.” It does not have rules or regulations on what colors signs must be, instead endorsing the common-sense design benchmark that sign text and sign background colors should carry 70 percent brightness differential ratio. In other words, dark text should be on light backgrounds, or dark backgrounds should display light text. ADA sign graphics are called pictograms. Many common accessibility signs contain near-universally recognizable pictograms with simple, centralized symbols signifying their message. Of the four sign categories, only identification signage has regulations pertaining to the scale, spacing and placement of pictograms. Note: SpeedPro staff members are available to consult and create your sign’s complete, compliant design. The ADA’s complete list of sign regulations can be technical and — truthfully — rather confusing. Reach out so that we can help. Certain industries have stricter signage requirements than others. While ADA sign guidelines apply to all businesses and sectors, the following face additional design standards given their services and facilities. Restaurants, bars and cafeterias already maintain federal and state safety and sanitation standards. ADA-complaint signage for the food industry ensures that these sanitation protocols are upheld along with other essential concerns like accessible entryways (ground level or ramp), accessible parking spaces and signage designating them. Grocery stores must also provide means for ease of access for people with disabilities. Given the narrow aisles, lanes and frequent redirection required during travel within a store, it’s important for grocers to create and display fully complaint ADA signage clarifying directions and reducing mobility and visibility burdens. Warehouses, factories and similar industrial environments require high-visibility, clear and concise messages marking various work zones and operating vehicle routes. The safety of workers on the floor depends on it, as does a manufacturer’s reputation. Braille characters are mandatory on all identification signs and highly encouraged on informational and wayfinding signage. Braille cells: Each Braille character is known as a cell, with individual cells comprised of tiny textured dots. Dots are dome-shaped — never square, pointed or plateaued — and come uniformly sized, 0.06 of an inch wide at the base and 1/4 of an inch high. Braille case: Lines of Braille should be written in sentence-case following contracted Grade II Braille shorthand when possible. Cell and dot spacing: Each individual dot should get .1 inch of space around its diameter. Individual Braille cells should be spaced .3 inches away from each other. Braille positioning: The lowest line of Braille on a sign should be located no less than four feet off the ground and no higher than five feet from the ground for reachability. 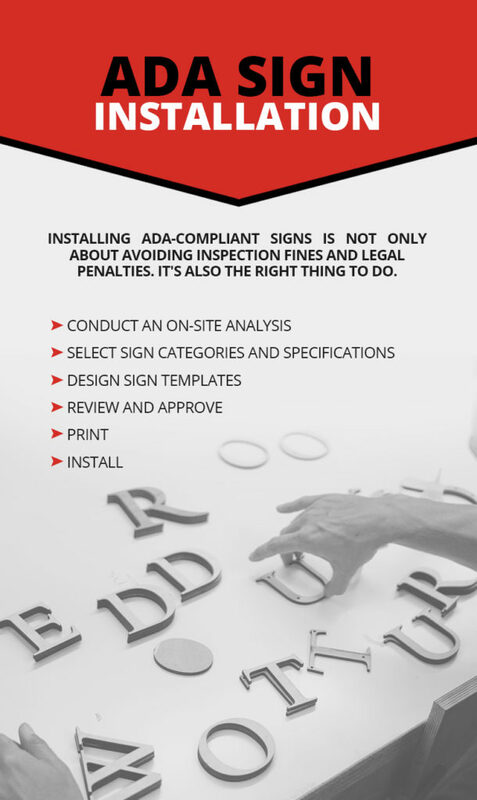 Installing ADA-compliant signs is not only about avoiding inspection fines and legal penalties. It’s also the right thing to do. SpeedPro’s nationwide network of studios can help make the right thing to do also the easiest thing to do. Clients ordering custom ADA signage and graphics undergo a step-by-step design process ensuring their signs meet all requirements — from ideation to installation. On-site analyses will measure available wall space, nearby door radius, floor-to-ceiling heights and overall room dimensions. These measurements will provide the base for your mounting options. You’ll need to ensure that the ideal spot for your sign is noticeable and unobstructed at all times. Some full-service printing studios — like SpeedPro — can perform an on-site analysis for you, providing a complete range of measurements necessary to outfit a correctly sized and spaced sign. As noted earlier, the ADA recognizes four general categories of signage. Each maintains its own size, character, height, clarity and mounting requirements, among other general visibility and clarity obligations. SpeedPro can assist you in picking the proper sign category for your application as well as walk you through that type’s detail level and any additional considerations. Full-service printing studios have the technology and equipment in place to create drafts of your final ADA signs. Base media, inks and finishes are high-quality, durable and follow the Americans with Disabilities Act and ADA Accessibility Guidelines (ADAAG). Raised lettering and Braille can also be added in-house, without the need for a second print or extra equipment. Ensure sign fonts, colors, sizes, scales, pictograms and finishes are to your liking. Then, we’ll double check final proofs against local and federal government signage standards in your industry one last time. The ADA requires all accessibility-related signs and graphics to contain non-gloss finishes. SpeedPro studios provide anti-graffiti, matte and satin laminates that adhere to this regulation, ensuring signage compliance is maintained down to the “finishing” details — literally. With your new sign in hand, you’re ready to go. Clear the installation wall or ceiling area, removing clutter and other visual obstructions. Check that there’s adequate lighting to illuminate your sign. Review any nearby opening doors to make sure their radiuses don’t impede sign visibility. Verify that the floor space directly beneath the sign is smooth and level. All these processes are ADA recommendations. Signs near doors should be installed latch side. Signs near double doors should be installed on the right-hand side of the right door. Signs should be wall mounted between 40 to 60 inches off the ground. Hanging signs should begin at least 80 inches off the floor. Signs should have 18 by 18 square inches of open floor space surrounding their base. Contact your local SpeedPro studio to simplify ADA signage and graphics compliance — and support a truly inclusive environment at your place of business.